Similar bills didn’t gain much traction before, but another round of layoffs at Boeing has renewed interest in the legislation among state lawmakers. The House Finance Committee heard public testimony on the measures Tuesday. The bills are a tweaked version of bills introduced in previous years that never gained traction in the Democratic-controlled House, but have received renewed interest after another round of Boeing layoffs was announced last month. “For me this is a matter of taxpayer accountability,” Democratic Rep. Noel Frame, the sponsor of one of the bills, said at the hearing. In a 2013 special session, the Legislature approved a suite of tax incentives aimed at Boeing and the aerospace sector meant to ensure that the 777X was produced in Everett. Most of the tax breaks were first approved in 2003 and set to expire in 2024, but the new legislation extended them until 2040. Those tax breaks are expected to save the aerospace giant more than $8 billion in taxes through 2040. But Frame noted that since that time, the company has shed more than 12,000 jobs in the state. In the past year alone, Boeing Commercial Airplanes reduced its workforce by more than 9,000, mainly through buyouts and retirements. At the end of March, Boeing Commercial Airplanes and the company’s other divisions employed 70,640 in Washington, down from 86,397 in January 2013. In Washington and elsewhere, Boeing Commercial Airplanes employed nearly 74,200 at the end of March, down from more than 83,000 at the end of 2015. “Subsidized foreign competitors and fewer widebody purchases across the industry have resulted in significant competitive pressure on every order,” he told the panel. He also noted that the company recently had to readjust expected production of the 777 from eight planes each month to five. “Sadly, rate reductions generally result in job reductions and this year is no different,” he said. Frame’s bill would require Boeing to meet an annual employment baseline of 70,000 jobs in the state to qualify for its preferential business-and-occupation tax rate. Boeing’s 0.2904 percentage rate is significantly lower than tax rates for other sectors. Under Frame’s bill, if Boeing’s annual employment level falls below 70,000 jobs, but above 67,500, its rate would increase to 0.387. If the level falls to 67,500, the rate would rise to the level that the rest of the manufacturing sector pays, 0.484 percent. Additionally, a tax credit the company could previously claim would be reduced by 50 percent if the employment level falls below 70,000, but above 67,500. If it falls below that level, no credit would be allowed. Any money regained by the state would go into an education account. The Legislature is in special session to address education funding as part of an overall two-year state budget that must be in place by the end of next month to avoid a partial government shutdown. Last year, Boeing announced that it saved $305 million through state tax breaks in 2015. 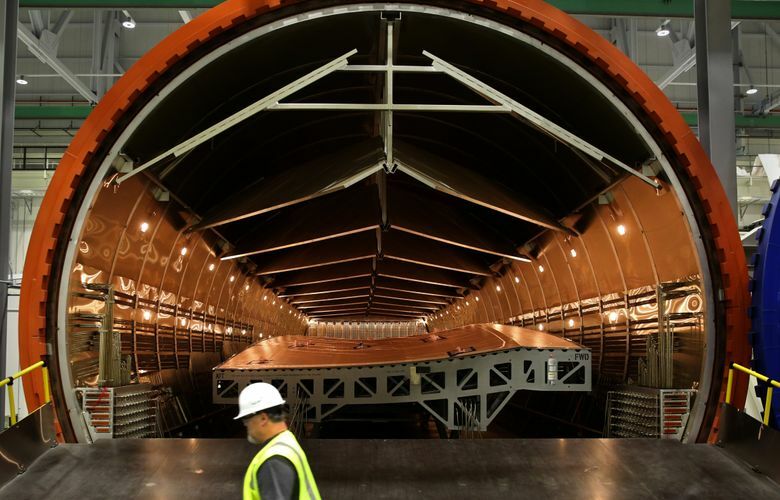 It was the first time the company has been required by law to publicly disclose such information due to a new requirement under a tax-incentive transparency law passed in 2013 that affects Boeing and hundreds of other aerospace firms in the state. At the time, the company also said it invested more than $13 billion in the state in 2015 — citing tens of millions in community contributions as well as tuition for employees seeking continuing education. McSherry pointed to that data in his testimony before the panel. “Boeing has kept its word to Washington,” he said. Republican Rep. Richard DeBolt, the sponsor of the second measure, said he felt that lawmakers needed to re-examine their policy related to the tax break. Under his bill, if the company did not maintain a seven-year average of 75,000 positions, the preferential tax rate would expire in mid-2024. Any money recouped would go to career and technical education, a new worker readjustment program and a small business tax credit account. Democratic Rep. Kristine Lytton, the chairwoman of the committee, said a decision has not yet been made on whether the bill will receive a vote. She said as lawmakers continue to try and reach a consensus on the budget, the exemption is worth a look.